Glad to hear this :) I've been watching several gameplays and it seems pretty awesome!! Do you know all evolution chart for shoutmon and gumdramon? rookie>adult>perfect>ulyimate?virus,vacine,data,uk or free? Shoutmon has no level but is listed between the last Child and first Adult Digimon, and evolves from Koromon or Gigimon. Gumdramon is in the same situation, but evolves from Tsunomon and Pukamon. Shoutmon is Free-Fire and evolves directly to Omega Shoutmon (Free-Fire) with no further possible evolutions, while Gumdramon is Free-Battle and evolves to Arresterdramon (Free-Thunder) with no further evolutions. Omega and Arrester also have no level, but are placed after the last Adult and before the first Perfect Digimon in the list. so its just botamon>koromon>shoutmon(rookie/fire/free)>omegashout(champ/fire/free)?no perfect or mega? I took a look at some aspects of the game, and yeah, I was expecting more, but it's far from a bad game to me. anw Ne0 is still a kinda bad game based on the score, Bamco was rushed. I'm optimistic about a western release. It's far from a bad game. It would probably have been better to push back development instead of try to meet the March deadline, but the size of the roster isn't something I'm personally concerned with--Re:Digitize shipped with only 74 Digimon in it, for crying out loud--rather I'd prefer that the roster be more diverse. There's almost no fully evolved Water-attribute Digimon, a lot of famous faces are missing (how did Gesomon miss out on both Cyber Sleuth AND -next 0rder-? ), and there's way too many Light and Dark Digimon. The ExEvolutions are also very samey, boiling down mostly to gogglehead dragons. They didn't even fit X7 in, and he'd be a great ExE! My biggest concern aside from diversity is that this is the first Digimon World game with no multiplayer mode. World 1 had multiple memory card + controller support for 2-player battle, Re:Digitize and Decode both had local wireless. All -next 0rder- has is the battle server, which just involves uploading your data and downloading an opponent's without actually playing together. I'd like there to be a point to all my stat maxing. the review score it got on amazon and the sales which is lower also percentage sales only 60-80% are all reasonable though. 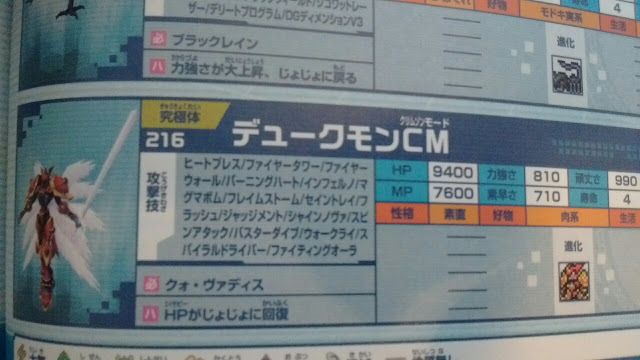 7. the stataments from japanese fans that the staffs of Ne0 actually didn't undertsand what Digimon World game is. Yeah Ne0 seems was very rushed and lower budget coz it used Unity engine. Also the fact that it provides more updates next month revealed that their most of decision making of the game was also too fast. the most disappointing thing is their decision on making some useless recolor variation of digimon, also filling the roster much with them. We don't want the orange ver of growmon, silver ver of kyubimon, etc. Most of the models are complete copy-paste from Cyber Sleuth, even they have same hissatsu waza as CySlu. Is it very hard just to transfer 3d models in Cyslu to Ne0? recolor is indeed ok, but if too much, it's bad. I just hope Kazumasa Habu is involved again in next installment of digimon games, not some random producer with no clear track record. Habu has been working since 2007 on digimon games, even had knowledge not many fans know about. The problem with the 217 playable Digimon is, if you take away all the recolours, you end up with a roster that is actually smaller than the one in Digimon World Decode. Granted Next Order has some great things but it's far from being the perfect DW1 sucessor we all been hoping it to be.